It might be because I work in publishing and totally unrepresentative of the outside world, but I’ve heard three people describe themselves as grammar Nazis this week. Now, I’d hate to try to out pedant anyone but why on Earth would you think that describing yourself as a Nazi is a cute or clever thing to do? It’s like nails on a chalkboard for me. I find silly grammatical errors irritating, but I just don’t really see pedantry as a badge of honour, especially when bundled together with connotations of fascism, racism and anti-Semitism. It just makes you sound like a bit of a tool. This entry was posted in Direct Speech and tagged grammar, grammar nazi, punctuation, spelling on May 31, 2013 by Siobhan. If you’re looking for a gentle, amusing read with a bit of contemporary relevance and by an author worth name checking, look no further than Various Pets Alive and Dead by Marina Lewyka, she of A Short History of Tractors in Ukrainian fame*. Various Pets Alive and Dead tells the story of the Free family, who used to live in a Socialist commune, as memories drift to the surface and secrets are revealed. It won’t change your life, but it might make you smile wryly. It may also leave you with the question: does everyone who ever had a younger sibling and a pet hamster at the same time have a story about what said younger sibling did to the hamster? This entry was posted in Book Reviews and tagged books, Marina Lewyka on May 16, 2013 by Siobhan. Isn’t it sweet? This is why I should post more letters. Then I might receive more of the same! 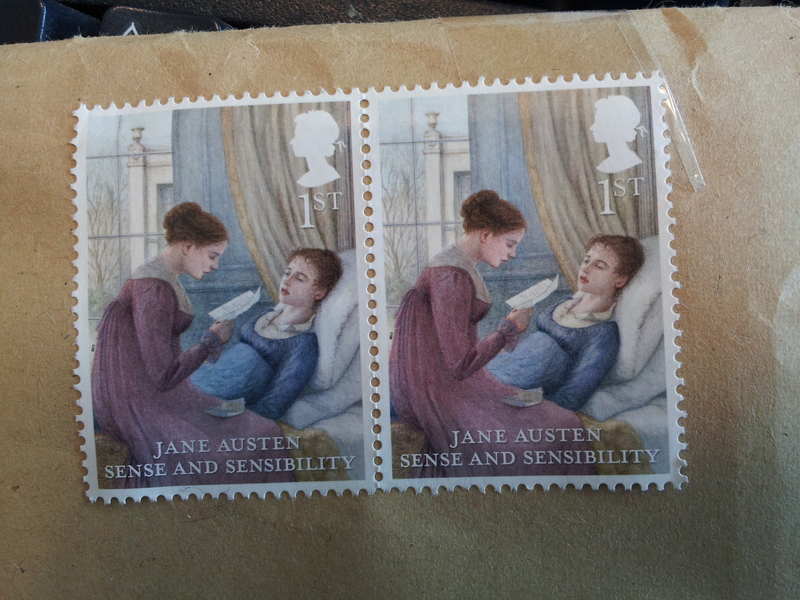 This entry was posted in Uncategorized and tagged books, Jane Austen, stamps on May 14, 2013 by Siobhan.